Every golf round starts with teeing off and the first tee can be a daunting prospect on some courses. Often the clubhouse will overlook the tee so you’ll usually have people watching you start and there’s nothing worse than topping it in that situation. Whether you are a beginner or you’re looking for some more advanced tips then read on four my masterclass in teeing off. Here are our top tips for teeing off when you’re just starting to play golf, scroll down for more tips for advanced users. Sounds easy but at times isn’t! Try to focus on what you are doing rather than what’s going on around you or where the ball is going – don’t bring your head up too quickly. If you’re playing with others just ask someone to watch where your ball goes so you can focus on what you are doing. It can feel like you need to get teed off quickly and get going at times but just take a few seconds to make sure you’ve got your setup right and then follow your usual swing patterns. Rushing usually leads to a top or a slice into the rough. If you are feeling nervous rather than trying to hit the ball as far as you can, reduce your swing speed slightly and go for a now accurate shot rather than trying to look the part with a big booming drive. Look at your course map and work out what club you need to hit, just because its a par 5 doesn’t mean you need to hit a driver every time. Look for obstructions around the distance you usually hit. If something is in the way then just take a club less and leave it short of the water or bunker. As a beginner at golf, it’s really important to get the basics right and have a slow and steady approach rather than trying to be Tiger Woods on your first round. It’s important to get the setup right for the club, you’ll have a different positional stance for the driver then you will for a long iron, and a different stance for a short iron – we’ll cover them all here. Selecting the right stance will make sure you get the maximum from the club and hopefully get a little more distance when needed. 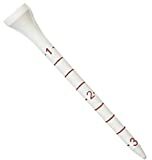 The tee – For the driver, you’ll need a long tee, I strongly recommend a packet of measure tees. These have markings up the side so you can check how deep the tee is. This will really help you to get a standardized approach to teeing off. You can get the ones I use from Amazon below*. This is a good hight for getting a good connection with the club in the sweet spot that the larger more modern drivers have. If you do find that you’re getting under the ball and chipping it a little too much then slowly reduce the height a couple of millimeters and see how that goes. If you’re out practicing then my top tip is to get the tee to the desired height and then just mark it with a sharpie where it comes out of the ground. Then mark a few other tees the same and keep them separate as your driver tees. This just takes the guesswork out of teeing up each hole and will mean fewer mistakes. This will mean you connect with the ball further round the swing giving it added distance and less spin. Generally, you don’t want to be putting backspin on your drives and want them running on the fairway as far as possible. Every time you address the ball for a tee shot you should be making sure your stance is correct for the club you have. The swing – Follow your natural swing and try and hit through the ball rather than hitting the ball. The ball should connect with the driver as part of a natural swing rather than trying to swing and hit the ball. By concentrating connection with the ball within your swing. At some time you may want to hit a 3 wood off the tee to get a little more loft into the shot if you have trees to get over or a good wind behind you. Simply drop the tee around 1/4 of an inch lower and you’ll be about right. If the tee does seem to hight adjust it accordingly but if your 3 wood is similar to the driver then this will work. If your 3 wood has a considerably smaller head then drop it 1/2 an inch down to use it from the tee. For a 5 wood drop it 1/2 an inch similar to the hybrid option mentioned further down this page. Teeing up – Unlike the driver, your iron tees should only be around 1/4 of an inch above the ground – basically, just the head of the tee showing. The long iron swing is similar to the driver with the short iron swing being more closed and allowing you to generate spin if you’re hitting into the green. Whilst they initially started as more of a recovery wood for use in the light rough hybrid clubs are becoming more and more common in golf. Some people love them, like me, but some traditionalist still think they shouldn’t be allowed in golf. These are a good option for teeing off when you need a mid-distance strike or aren’t confident enough to be hitting the driver from that specific tee. To tee up you need to be at a mid-height on the tee, around 3/4 of an inch above the ground, nowhere near the height of a driver or 3 wood but still above an iron tee. If you look at the club the ball should be positioned roughly halfway up the club face. With the varying different hybrid clubs its difficult to give an example but if you start halfway up the face and then tweak from there to suit the club and loft that you have.